Today is National Dog Biscuit Appreciation Day. I’m not entirely sure why we’re supposed to appreciate them, but whatever, I’m just here for the baking of weird things. Since I don’t have dogs, but I *do* have cats, I decided to fudge it a bit and instead of making dog biscuits, I made cat treats instead. There’s lots of recipes online for how to make treats for your particular variety of furry companion, but I used this one. The ingredients list is short – a can of tuna, an egg, some flour, and for some bizarre reason, parsley (I skipped that one). 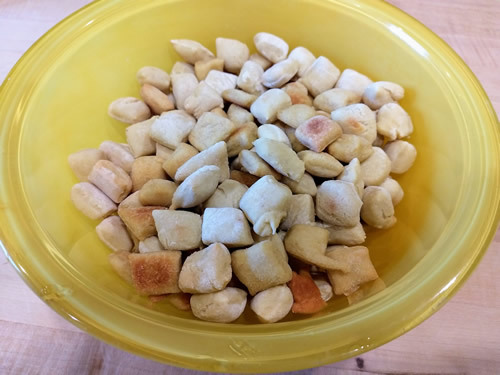 You whisk it all together in a food processor or a blender, then roll it out, cut it into tiny little shapes, and bake them. Richard provided assistance for this one, in the form of distracting the cats, first with the juice from the can of tuna as it was drained, and then while I was rolling out the dough, in case any of the cats came over to investigate. Luckily the cats were sated enough with the tuna juice to leave me and my dough alone. One recipe makes a *lot* of tiny little treats, by the way. A *lot*. From left to right, Sherman, Azzie, Rupert. But Azzie was the only one who actually ate the treat and yelled for more. Nutmeg, naturally, wasn’t interested because in her eyes, anything that isn’t kibble is Not Food (weird cat). Sherman and Ruby just nibbled on theirs and then left the slightly gummy mess on the floor and looked at me as if to say ‘why should we care?’ Ingrid sniffed it and then gave the cat equivalent of a shrug and walked away, while Rupert ate one but slowly, and without much enthusiasm. The recipe didn’t call for the size of tuna can, and I wonder if I was supposed to use the larger one, and not the smaller one, because I had to add a bunch more flour to make the dough stiff enough to roll. Richard and I tried them (because why not?) and they’re kind of….bland. Sort of like a cracker with the barest hint of tuna flavor, and not much else. Ah well. 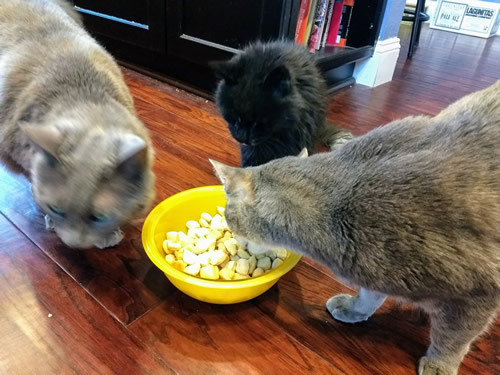 The cats will just have to settle for all the other treats in the house. Poor neglected things. This might be why it’s National Dog Biscuit Appreciation Day and not the cat version. I’m pretty sure my dogs would both eat the entire bowl and then bug you for more.